A kettle is an essential element in any camping trip – and not just for a lovely cup of tea at any time of the day! Relaxing in a tent with hot drink after an active day outdoors is one of the true pleasures of campsite living. It rivals the tea or coffee first thing in the morning as sleepy campers stir into life. 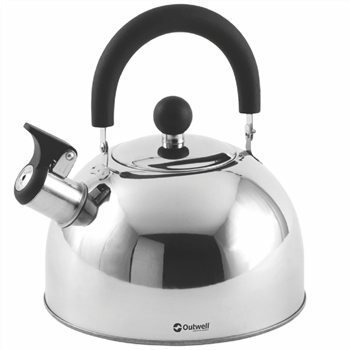 Super stylish Outwell Tea Break Kettles offer a choice of size and colour options to suit campers’ tastes. With smart designs and inspired innovation, there’s a wide range of superb products for cooking and eating on site in the versatile Outwell Cooking and Tableware Collection. As the one-stop shop for family campers, Outwell has the ideal pot, pan or kettle complemented by the stylish plates, bowls, mugs and cooking essentials featuring the design flair and attention to detail seen throughout all our tent and equipment collections. Smart colours and patterns in tableware plus flexible cook sets deliver reliable designs for true home-from-home comfort and convenience. Collaps, Cook Sets, Tea Break Kettles, the all-new Beverage options, Bamboo tableware, Melamine tableware and Polycarbonate glassware plus our practical Accessories all add essential elements of comfort to campsite life. Excellent value for money. Arrived quickly and has performed well to date. Not tried on wood burning stove yet but on camping gas cooker great. What's not to like for £11? !